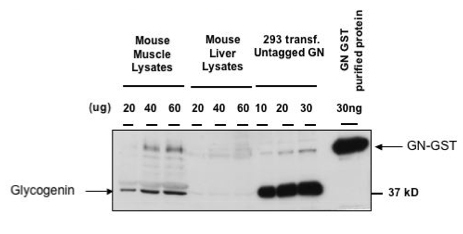 Various mouse tissue lysates, HEK293 cell lysates tranfected with glycogenin (without any tag) and 30 ng of bacterially expressed GST-glycogenin were subjected to SDS-Page, transferred to nitrocelluose and immunoblotted with anti-Glycogenin at 1 ug/ml. Binding of the primary antibody was detected using rabbit peroxidase conjugated anti- sheep IgG antibody (1 in 10, 000 dilution, Pierce) followed by enhanced chemiluminescence (ECL, Amersham). Structural basis for the recruitment of glycogen synthase by glycogenin.